Tim or Anthony got the question wrong. You can't blame them. Tim doesn't know he's living in the 21st century and Anthony Watts wouldn't know a p value from his elbow. It's clear from the article that this wasn't the question he was asking (rhetorically - he didn't attempt to answer it.) By "sample size" he didn't mean the number of observations. Nor did he mention frequency of observations. What he meant was over what period of time should one take observations in order to extract meaning from the results. He was effectively asking what duration or period needs to be looked at in order to determine change in climate. Tim didn't mention coverage, except to claim (wrongly) that observations are only available for 25% of the planet. He's wrong. That 25% claim of his would have irked Christopher Monckton. It must also have annoyed Christopher that Tim says 120 years isn't enough. Christopher swears that we can tell that climate change has "paused" because of only 18 years of satellite data, which, he argues, gives 100% perfect pristine coverage. Coverage is near but not completely global for all the levels in the upper air. Tim also made it quite clear that he is scared of climate change. This is common among science deniers and goes a long way to explaining why they reject the science. They can't cope. They will lash out like bullies and cower like cowards (eg Anthony Watts). This fear of being "scared" is consistent with science denial (in the USA at least), being predominant among conservative voters, whose emotion interferes with their reason. Tim claims that showing that human activity causes global warming is "done purely for political propaganda, to narrow people’s attention and to generate fear". there was no such thing as glacials, interglacials, hothouse climates or snowball Earths. I don't know what notion he has in his head when he writes about "only a few variables", but he seems to be suggesting that the laws of physics are not constant. That in different periods of time, the laws of physics operate differently. Nor does Tim "believe" that carbon dioxide is the well-mixed greenhouse gas that it is, writing that it "varies considerably spatially and temporally". I guess he doesn't "believe" in satellite data either. (I wonder does he know that there are such things. If he does, he probably thinks they are there to spy on him, in preparation for carting him off to a FEMA concentration camp.) 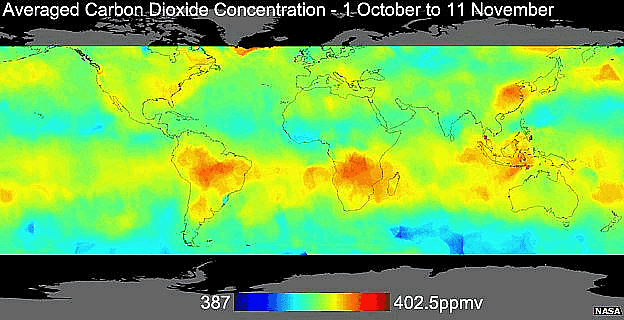 Here is a map of CO2 from the new satellite OCO-2, which clearly shows that the concentration only varies by a few parts per million. Note the scale at the bottom is from 387 ppm to 402.5 ppm. And there are few if any places at the extreme of the scale. Measurements at ground stations around the world confirm this. Tim can't tell the difference between the temperature changes in Antarctica, on the summit of Greenland, and the world as a whole. He launched into a good impresson of Denier Don Easterbrook. Going by how he portrayed Greenland temperatures as global, he thinks that the Earth has an average temperature in the minus 30s - Celsius! He thinks that in the previous hottest ever period in the Holocene, the temperature of the planet got as high as minus 29 Celsius! (I guess he doesn't travel much.) He also can't make up his mind if this year is 1970 or 1935. 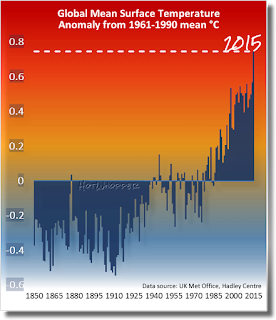 After claiming that the temperature from 1850 to the present is only 120 years of data, he then shows a chart that claims the year 1950 was the year 2000. Tim is temperature-challenged and geographically-challenged. I'd say he's nuts. He claims that it is colder now than for most of the Holocene. He bases that on his misrepresentation of a temperature chart of the GISP2 site on the summit of Central Greenland. The chart only goes to 1854, but Tim in his delusion thinks it's current. I can't tell if he thinks that it goes to the year 2015, or 2000, or 1905 (95 years "before present" with his "present" mislabeled as 2000 instead of 1950). He doesn't say. The age of the Earth is approximately 4.54 billion years, so the sample size is 0.000002643172%. Tim didn't answer the question directly, but he did spend a lot of time looking at the temperature on the summit of Greenland, going back 10,000 years or so. So I'm guessing that he's happy enough with a "sample size" of 0.000220264317%. 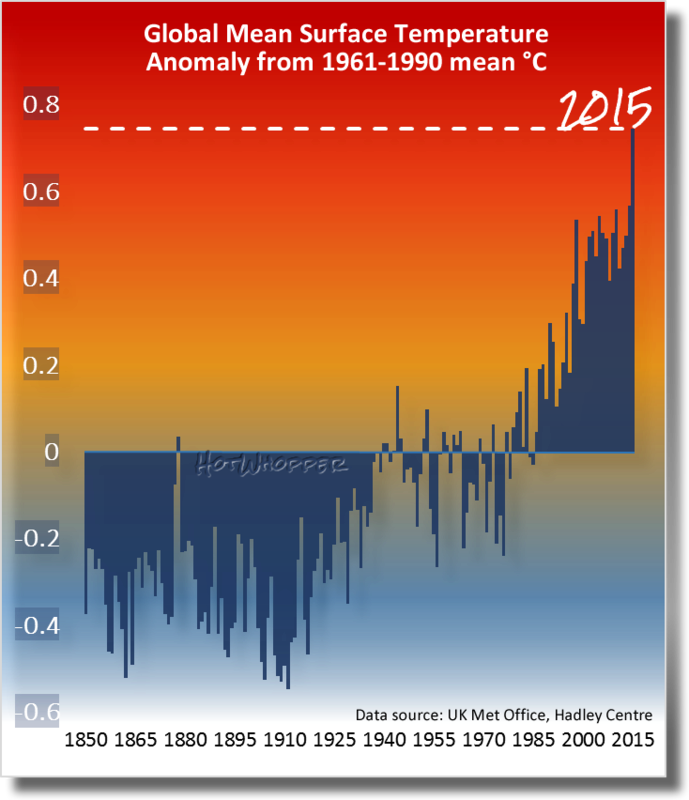 Marcott13 should suit his purpose, with the added bonus from Shakun12, courtesy of Jos Hagelaars on Bart Verheggen's blog, Our Changing Climate. 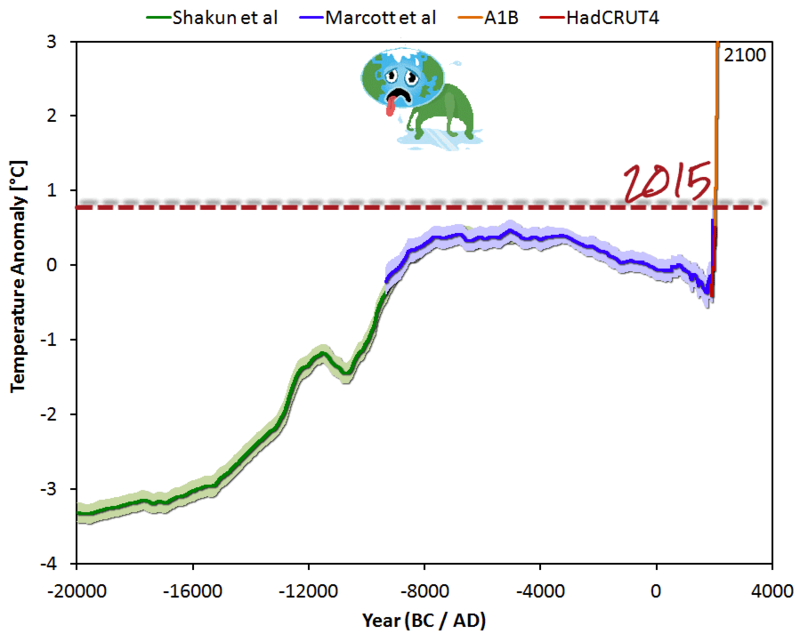 Figure 3 | Global surface temperature of the past 20,000 years and the likely future. The temperature reconstruction of Shakun et al (green – shifted manually by 0.25 degrees), of Marcott et al (blue), combined with the instrumental period data from HadCRUT4 (red) and the model average of IPCC projections for the A1B scenario up to 2100 (orange). Source: Jos Hagelaars with my annotations. Tim is one delusional denier of the utter nutter kind. There's a heap more I could have picked on from his article. I barely covered a quarter of it. Still, I think you've read enough to get the picture, and there's only so much nausea one can cope with in a day. Why Anthony Watts adores him is not clear. Tim's a greenhouse effect denier, a "sky dragon slayer", an uber conspiracy theorist and a sleaze, who'll defame anyone and everyone. Actually, most of those descriptions fit Anthony Watts, too, these days. Birds of a feather. WUWT has become nothing more than an empty vessel where weirdos like Tim Ball and his fans bang about and strut their stuff. I cannot imagine anyone sane going to WUWT in the hope of learning anything about climate, or science. There are a small number of valiant people who perhaps think they might just make a difference. Or maybe it's nothing more than habit, a hangover from the days before Anthony banned almost everyone who appreciates science, before Anthony Watts decided to tailor his blog for utter nutter conspiracy theorists. Or it's masochism. There are probably gawkers who are indulging in their dark side, peering into the cesspit of humanity, students of the macabre. Going to WUWT these days is like watching the tortuous, incomprehensible behaviour of malformed beasts. When you pit Science against Politics, Politics wins in the short term. However, eventually Reality comes to the rescue of Science and Politics fails to survive. Reality is underway. And real reality is scary stuff. Especially if it is another Ice Age looming. What is a reasonable sample size? 500 years. Warmists are very generous to us when they only predict – pardon me, project – for 100 years. Try to counter a projection of climate (all over the Earth) in 2516.
markstoval is a hard-core denier who spends an awful lot of time at WUWT ignoring the facts, hoping against hope that they'll cease to exist. He also thinks algoreisfat. Another great essay Dr. Ball. AB doesn't understand a word of what Tim wrote but had to post a "thought". Excellent – but depressing that what is so in your face logical is beyond the ken of many politicians and joe public. Marcott, Shaun A., Jeremy D. Shakun, Peter U. Clark, and Alan C. Mix. 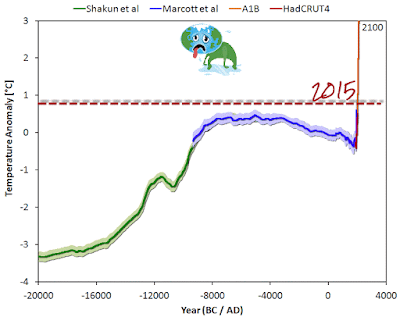 "A reconstruction of regional and global temperature for the past 11,300 years." science 339, no. 6124 (2013): 1198-1201. Shakun, Jeremy D., Peter U. Clark, Feng He, Shaun A. Marcott, Alan C. Mix, Zhengyu Liu, Bette Otto-Bliesner, Andreas Schmittner, and Edouard Bard. "Global warming preceded by increasing carbon dioxide concentrations during the last deglaciation." Nature 484, no. 7392 (2012): 49-54. And for years they have insisted on using whatever miniscule sample size allowed them a 1997/1998 start date. WUWT has become nothing more than an empty vessel where weirdos like Tim Ball and his fans bang about and strut their stuff. While I respect Nick Stokes' optimism or fortitude for adding his own informative comments, I have to agree with this assessment. I tried to figure out what Ball was going on about but couldn't; it was a muddle from start to finish. "The AGW proponents successfully got the world focused on CO2, which is just 0.04% of the total atmospheric gases and varies considerably spatially and temporally." Not according to satellite data. You do like sat data? So well-mixed indeed that you can even see the NH seasonal changes to atmospheric CO2 concentration reflected in a trace from the South Pole. "I used to argue that it is like determining the character, structure, and behavior of a human by measuring one wart on the left arm. In fact, they are only looking at one cell of that wart for their determination." Nope - the best analogy is drinking 0.04% solution of cyanide in water. In other words the absolute proportion of anything is irrelevant - what is relevant is the power of that substance to change it's environment. "The AGW proponents successfully got the world focused on CO2, which is just 0.04% of the total atmospheric gases ..."
The Environmental Health proponents successfully got swimming pool owners focused on Cl2, which in its free form is just 0.0004% of the total pool water. There's a correction just below, so read all the way down the subthread. You may be interested in reading the "tennis" between richardscourtney and myself following my above post on WUWT. Not as nasty as Stealey or Painter but still hypocritical and with delusions of omniscience. Thanks Bernard I'll remember the O3 thing for next time. What I find amusing about the trace gas argument, is that it so contradicts the other argument, that CO2 is the "gas of life". If there's too little CO2 to do any harm, how can there be enough of it to keep all life going? Yes indeed Tadaa - and you end up chasing the strawman. Mind I new what I was doing. It's the condescension of the man - just because "I've had a paper published in a journal" - and I've taken the time to teach you attitude. I'm supposed to supplicate myself before him. Away with the fairies - and as I've experience most times with them - the "down the rabbit-hole" experience you get. Even to the point of them saying that you are insulting them, when I was carefully moderating my reply and not upping the ante. They do need to have their echo-chamber pomposity pricked though. If all it does is discomfort them then I'm happy.